For many triathletes, the swim is the most challenging, intimidating portion of the sport; even a very fit athlete can struggle in the swim if he/she does not have good swim technique. 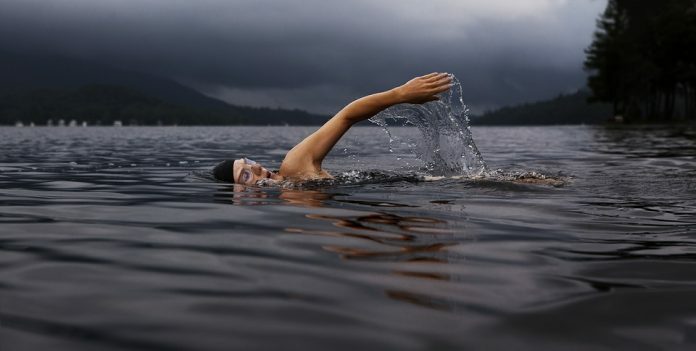 The majority of a triathlete’s training is done in a pool, but most triathlons are held in open water (lake or ocean), which adds an entire additional layer of challenges. Here are some tips for your next open water swim. For new and experienced triathletes alike, you need to practice swimming in open water. Just because you are awesome in a pool doesn’t automatically mean you will fare as well in open water. You will need to become accustomed to swimming without being able to see under water, without lane lines, with waves and you will need to practice your sighting. It’s never a good idea just to jump into a race without warming up. When your muscles are not warmed up, they do not respond as well. If you can get in the water for a quick warm up, that is ideal. If you cannot get in the water, you can do a short run or do some arm circles or shoulder rotations before you start. Make sure you have several pair of goggles that you are comfortable with. Nothing is more stressful than having your one and only pair of goggles snap right before your race. You may also want to consider different lenses: clear for slightly cloudy days, smoke for partly sunny days and mirrored for sunny days, particularly when you will be swimming directly into the sun. Make sure you are used to swimming with a swim cap on. Women may already be used to this, but men are not. Races require you to have a swim cap on. Be sure your tri kit is snug so that it does not catch water as you swim. If you are using a wetsuit, be sure to practice in it several times to make sure it is comfortable and does not feel overly constricting. Sighting is a very important part of open water swimming, but this doesn’t mean you should sight every two or three strokes. Be sure to practice sighting in a pool (you can set a water bottle down at the end of your lane) and practice some more when you get into open water. It’s important to lift your head only enough to be able to sight the next buoy (or finish) and put the head right back down in the water. Lifting your head too high or for too long causes the hips to drop and your arms to push too deep into the water. This skill is critical for successful open water swimming. It helps you swim a straighter line, but will also help in other ways. For example, if waves are crashing in to one side, you can breathe to the other side. Additionally, if you find yourself swimming very close to another athlete, instead of risking an elbow to the goggles, you can breathe to the other side until that athlete is not in such close proximity. It may sound like a simple thing, but most people do not practicing turning around an object. In a pool, we simply go back and forth in a lane with a flip or open turn at the end. This means we are always swimming in a straight line. In a triathlon, you will need to swim around buoys where the course can take a slight angle, a sharp angle or even force you to turn around and go back the way you came. Please note that most swimmers want to cut to the inside of that line to the buoy because it is the shortest distance. However, that area around the buoy can become very clogged up with swimmers hanging on to the buoy for a rest period, or worse yet, breaststroke kicking their way around the buoy. This is a recipe for disaster. Swim just a little wide of the buoy, but be sure to practice turning so that it comes easier on race day and you don’t have to slow down. Not only is it important not to swim alone in open water, it is actually very good training. In the pool, there are lane lines and everyone can see each other in the water and you can avoid contact. The opposite is true in a triathlon – it is very likely you will be bumped or hit accidentally and it is important to become accustomed to that feeling and know how to do your best to avoid it and protect yourself. Practice a mass swim start and learning how to navigate your way out of a crowd of swimmers. Open water swimming does not have to be intimidating. With the above tips and some practice, you will be swimming as comfortably in open water as you can in a pool. If you are having trouble with your open water swimming or are looking for some other swimming help, please contact me. I’ll help you improve your swimming skills and confidence. MJ Gasik started competing in the sport of triathlon in 2003 and has completed 12 Ironman distance races including the World Championships in Kona, HI. MJ is a USAT Certified Coach, Ironman U Certified Coach, USMS Level 4 Certified Coach and is the founder and owner of Tri Right Coaching. MJ has coached hundreds of athletes from beginners through elite to personal bests in distances from sprint through Ironman.